Blanch Cantonese fine noodles in boiling water for 2 minutes, drain and drizzle with olive oil. 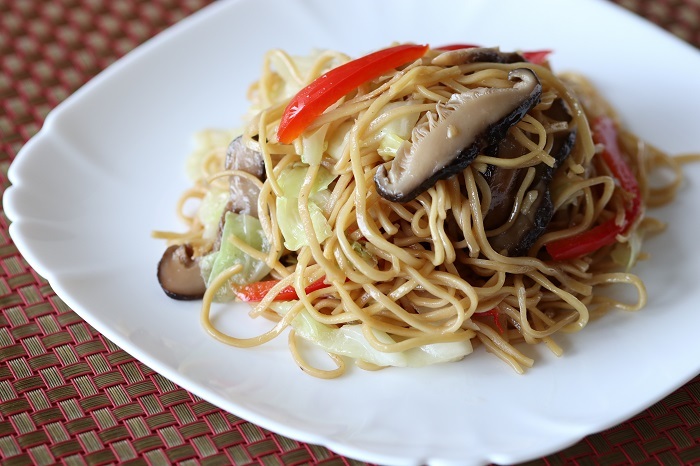 Heat wok with oil and stir-fry mushrooms until fragrant. Add cabbage and noodles. Stir-fry a while in low heat. Add seasonings and stir-fry until noodles are well-coated in sauce. Plate up and garnish with red pepper juliennes. Use long chopsticks to toss the noodles, instead of a spatula. Only add red pepper juliennes in the end to avoid overcooking. A successful entrepreneur before ordaining as a Buddhist nun, Venerable Shan Ci is also the founder of the Four Graces Charity, assisting impoverished families and communities throughout China. In 2014, she ordained under Venerable Guan Cheng. Ven. Shan Ci is currently a resident nun at the International Buddhist Temple in Richmond, BC.